I’ve been enjoying weekly visits to my local farmers’ market this summer, which seems to be just bursting at the seams with delectable produce and sweet juicy summer fruits. Everything looks so good that I’ve had to develop a shopping tactic. First I make one complete circuit, stopping here and there for a sample, scouting for the best of all of the farm fresh veggies, fresh picked fruits and baked goods. I make a mental note of what I really, really want to buy (as opposed to just really want to buy), then double back to make those purchases. 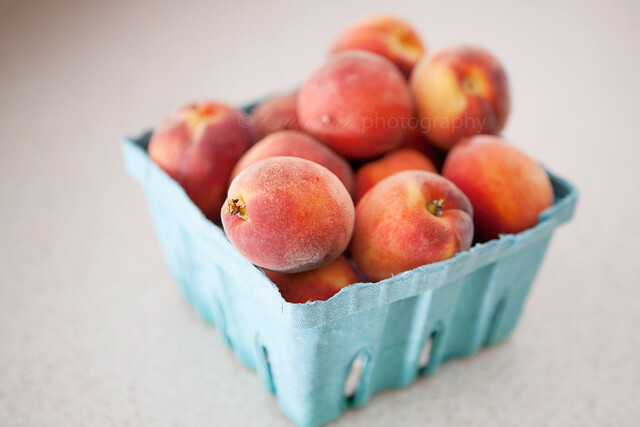 Lately the peaches at the market have been catching my eye. I don’t think I would rank peaches as one of my favorite fruits. I like them fine, though I don’t eat them nearly as often as, say, pineapple. But the peaches at the market were so fragrant and bright they just called to me. So I took them home and gave them a bath in bourbon. Yeah, you heard me. Bourbon. I’ve had a slight obsession with Greek yogurt going on for a while now, so I figured the best way to eat these peaches (aside from the few I ate out of hand) was to cook them down in some bourbon and brown sugar, then top them with Greek yogurt. All I have to say is wow. Desserts don’t have to be smothered in chocolate or contain 3 sticks of butter to be amazing. Try it. You’ll see. * My peaches were small, so I opted not to peel them. The skin peeled off they cooked, so I just pulled it out with a spoon (not fingers, that sugar mixture is hot!) and discarded before eating. If you have larger peaches and want to peel them first, score the bottom of each peach with an X and blanch them in a pot of boiling water for 30-40 seconds. Drop the peaches in an ice bath and the skins should peel right off. Combine peaches, bourbon, water and brown sugar in saucepan over medium heat. Bring to a boil. Cook until peaches are tender (and skins peel off, if unpeeled), 5-15 minutes, depending on peach size. Remove from heat and stir in cinnamon. Cool. Serve topped with yogurt and pecans. If you like bourbon for breakfast, I highly recommend trying some Bourbon Cranberry Sauce on top of french toast. It’s divine! Wow. These photos are breath-taking! These are the best photos of peaches I’ve ever seen. Totally agree with you. I have thick strained yogurt almost every night with some sort of healthy topping and its dessert to me! 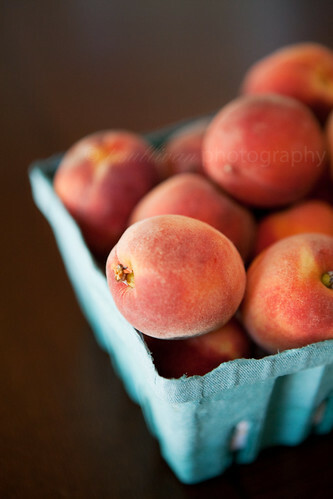 Love the idea of these peaches and pretty pictures! 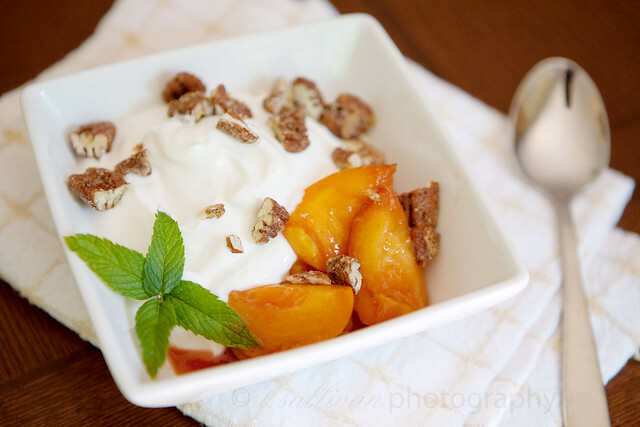 Sweet peaches ans sour yogurt, perfect combination! I always seem to sleep too late on Saturdays to make it to the farmer’s market, but my grocery store had a section of produce from local farms this week and I bought a bunch of peaches. I may have to get some bourbon just so I can try this. I bet they’d still be good with the brown sugar by itself, though!